Organ transplantation has assumed a high priority in national strategy and receives great emphasis as a future emerging industry. The Government has invested heavily in research, development, and personnel training in transplantation technology. Liver and kidney transplants have become routine surgery in clinical practice. New techniques are emerging and spreading throughout China’s provinces. Not only are the major hospitals engaging in transplants; but small hospitals are unwilling to miss the opportunity. The shift from socialism to capitalism in China meant withdrawal of government funding from the health system. Before the change, the Government owned, funded and ran all hospitals. All physicians were state employees. With the transition to capitalism, this system was dismantled. 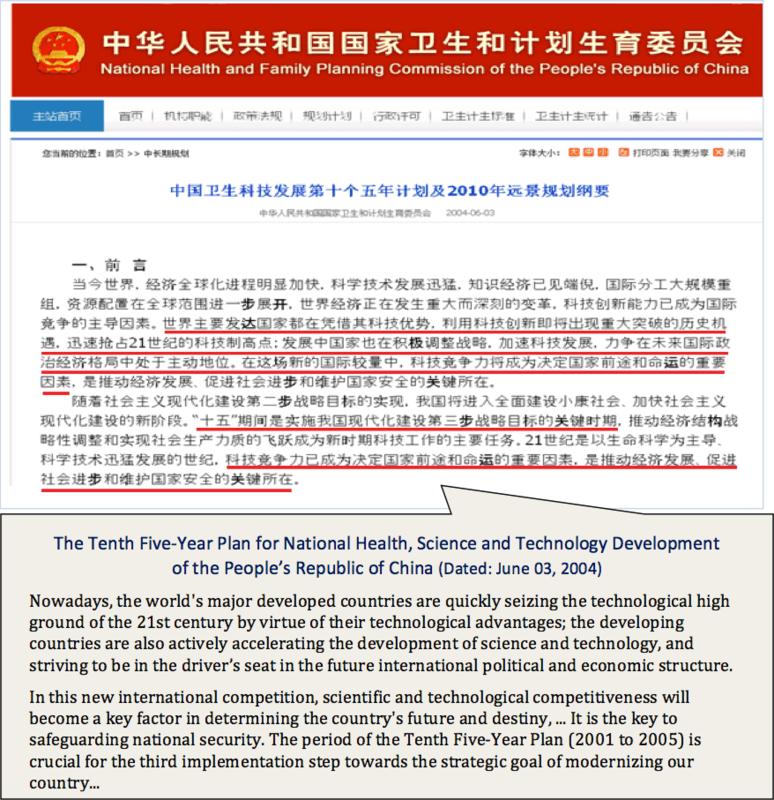 From 1978 to 1999, the Beijing government’s share of national health care spending fell from 32 percent to 15 percent. Between 1990 and 2002, public funding as a proportion of local public health revenues went from almost 60 percent to 42 percent. Ever since the Deng Xiaoping era, the Chinese military has been given a high degree of latitude to raise funds through entrepreneurial schemes using military resources and infrastructure. The military hospitals are no exception to this long-standing arrangement. While the system responsible for providing organs for military hospitals is maintained by military expense, transplant profits do not fall under military oversight. Accordingly, the trafficking of organs has become a method for military hospitals to make direct profits. According to an archived webpage from 2008, Changhai Hospital of the Second Military Medical University advertised an average hospitalization fee of 50,000 RMB for kidney transplants.1741 The original page has since been removed. Different hospitals charge different fees for transplants but they tend to follow a common trend. From a few examples of the main players in China’s organ transplant industry, we can see a decline in medical and pharmaceutical costs coinciding with an overall increase transplant fees. The main factors driving transplant costs are the treatment itself (including surgery and hospitalization costs), pharmaceuticals (including the ongoing regimen of anti-rejection drugs), and the donor organ source. As we observe, at the early stage after 2000, transplant prices steadily declined due to technological development and abundant organ sources. The dramatic decline of surgery costs and treatments made it affordable for a wider range of patients. The maturation of technology and increase in both domestic and international patients led to an exceptional growth in China’s organ transplant industry. Since international patients are charged much more than domestic patients, organ tourism became a factor in driving up transplant prices. 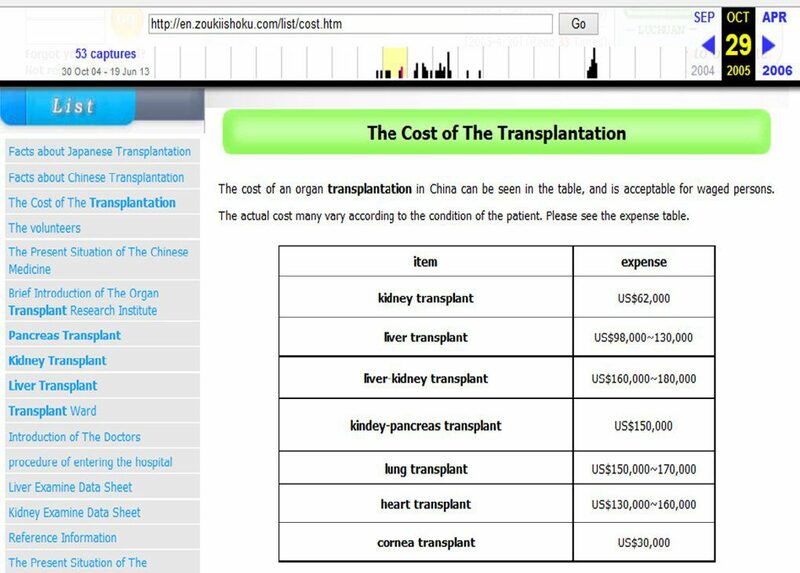 After the organ harvesting crimes were revealed in 2006, transplant prices generally stabilized due to the shrinking international market. Nevertheless, compared to the number of patients waiting for transplants, the transplant capacity of hospitals and organs available are still scarce resources. Despite an endless line of domestic patients in need of transplants, the profit-maximizing strategy for hospitals is to provide transplants to those most willing and able to pay. This can be seen in Huang Jiefu’s push to establish a platform to provide organ sources to Taiwan. Furthermore, we see international patients being charged more than domestic patients, to the tune of hundreds of thousands or even millions of USD–fees that are many times the treatment and pharmaceutical costs involved. This scheme takes advantage of the extremely inelastic nature of the market, given that these patients from other countries would otherwise have to wait years for a transplant. Immunosuppressant drugs can lessen rejection responses from tissue type incompatibility. Globally, sources and patients with six out of ten matching points are considered tissue-type compatible. The number of matching points has a direct impact on the rejection rate and the amount of immunosuppressants needed. In China, however, 4 matching points, or sometimes even fewer, are acceptable. As a result, patients would have to rely on large doses of immunosuppressants after receiving transplants. Patients who develop severe rejection responses would require second or even multiple additional transplants. These pharmaceuticals also provide doctors a source of kickbacks, which contribute to some doctors’ aggressive pursuit of even marginal recipient prospects. Because immunosuppressant regimens are individualized, they vary among hospitals and patients. Our hospital survey shows that the annual cost for post-transplant immunosuppressants range from 10,000 to 60,000 RMB. The cost decreased over time as domestic immunosuppressants gained market share. We discuss immunosuppressants in more detail later in this chapter. The experience and practice of the People’s Liberation Army No. 452 (Chengdu Air Force) hospital jumped from “township-scale” to that of a large-scale hospital in just a few years. Other military hospitals followed suit. An article “Relying on the Market to Protect the Battlefield” by Xinhua Net and other domestic media in 2009 reported1767 that, when Zhang Cong became the hospital’s president in 2000, the troubled hospital had more than 6 million RMB in debt. Its kidney transplant division used to be the hospital’s best-known department. However, due to the lack of funds needed to update its equipment, its number of patients decreased day by day. Five years later, the hospital bought back the facilities, equipment, and management rights from the investor and embarked on a new entrepreneurial path. Very soon, the number of kidney transplants performed by the PLA No. 452 Hospital ranked first among all hospitals in Sichuan Province. After the hospital grew from its original 210 beds to more than 1,000 beds, Zhang became the president of the PLA No. 309 Hospital in 2013. The annual income of Daping Hospital, affiliated with the Third Military Medical University, also increased from 36 million RMB at the end of the 1990s, when it began organ transplantation, to over 900 million RMB in 20091769—an increase of nearly 25-fold. These examples show that the growth in organ transplantation continued after 2006. One aspect from our hospital survey that impressed us is that the vast majority of medical universities and their affiliated transplant centers, military and civilian, have received significant funding from all levels of government. The regime has prioritized organ transplantation in its national strategy and invested heavily in research, development, industrialization, and personnel training in transplantation technology. There have been twelve Five-Year Plans, with the first beginning in 1953. Although they are called Five-Year Plans, most of them are nothing more than long-term projects. Through macro environmental transformations every five years, these plans can be sustained and implemented. Since the advent of the persecution campaign against Falun Gong, the Government of China has continuously incorporated organ transplantation into its Five-Year Plans for multiple ministries–a rare occurrence. Since 2000, these national plans and programs and other national funds have incorporated a large number of projects related to organ transplantation, one of the “comprehensive, leading future emerging industries” that is meant to drive China’s future global development. The largest transplant center in Asia is located in Tianjin. The director of the Oriental Organ Transplant Center of Tianjin First Hospital, Shen Zhongyang (also director of the Institute of Organ Transplantation of the Chinese People’s Armed Police General Hospital), was named the “father of Chinese liver transplantation.” He was appointed as the chief expert of the organ transplant program under the national “863 Program” and an expert in biological and medical technology under the same program. 1780 He claimed that organ transplantation is gospel in medicine and will change the world, that China has 130 million Hepatitis B carriers whose conditions are irreversible, and that the only solution is liver transplantation. The First Affiliated Hospital of Zhejiang University has the largest transplant center in eastern China. The hepatobiliary and pancreatic surgery center and its affiliated liver transplant center have a team of 134 medical professionals, including Zhen Shusen, a member of the Chinese Academy of Engineering, and nearly 40 senior transplant experts. Among them, 60% have doctoral degrees. The center has 340 beds. The Organ Transplant Center of the First Affiliated Hospital of Guangzhou Sun Yat-sen University has engaged in more than 50 research projects, including the national “863 Program “, “Twelfth Five-Year National Key Technology Research and Development Program”, and a National Natural Science Foundation project during three recent years. In addition, other prestigious universities and affiliated hospitals, as well as almost all military and civilian medical universities and their affiliated hospitals, are rapidly developing their organ transplant research and receiving a large amount of national funding. These institutions include Tsinghua University, Peking University, Renmin University, Shanghai Tongji University, Wuhan University, Central South University, Jilin University, and Lanzhou University, etc. These examples reflect that the Chinese Government has made organ transplantation a high priority in its national strategy, and have been stimulating and driving its development. Many Communist Party and government officials at all levels have supported the hospitals’ transplant activities, by helping to remove the obstacles of development, providing financial aid, or playing a matchmaking role in establishing collaborative relationships between transplant centers. We give a few cases below as examples. Organ transplantation in China began when Wu Jieping, a member of Chinese Academy of Sciences and Chinese Academy of Engineering, completed the country’s first kidney transplant in March 1960.1799 Kidney transplantation experiments were expanded nationwide in the 1970s. Since 1990, more than 1,000 kidney transplants were being performed each year. By the late 1990s, around 80 kidney transplant facilities had been opened nationwide, each averaging less than 20 annual operations. According to Zheng Shusen in March 2006, liver transplantation in China went through three stages of development.1800 The 1970s was a period of experimental and clinical exploration: Tongji Hospital in Wuhan and Ruijin Hospital in Shanghai first carried out clinical liver transplants in 1977. Liver transplantation soon peaked before declining and coming to a standstill in the mid-to-late 1980s. It rose to 78 cases between 1990 and 1998, reaching 16 in 1997 and 27 in 1998. The volume then jumped to 115 cases in 1999 before surging. Each facility has also gradually matured in its clinical experience. Since 2000, a large number of national and military transplantation medical technology research centers and key research laboratories have been established, incubated new transplant technologies, and led the rapid development of the transplant industry. After nearly 40 years of preparation and then relying on a living organ bank, transplantation in China saw a unique explosive growth from sporadic cases to the large-scale transplant industry it has now. Shen Zhongyang, the director of both Tianjin Oriental Organ Transplant Center and the Liver Transplant Institute of the Armed Police General Hospital, is known as the founder of China’s modern clinical liver transplantation. He is the first in China to establish a multidisciplinary liver transplant standard and procedures. With surgery as the central link, he standardized a process for liver transplantation with multidisciplinary collaboration. As a result, liver transplants have become part of routine clinical practice in China. Shen pioneered and improved a variety of liver transplant surgical procedures. He developed an integrated prevention system that reduced the recurrence rate of the hepatitis B virus (HBV) after liver transplants from over 80% to under 5%.1803 This advancement resolved a major obstacle in liver transplantation in China. He wrote books including Clinical Liver Transplantation, Modern Clinical Liver Transplantation, China Liver Transplantation, and Liver Transplantation Manual to address continuously emerging theories and technologies. He helped 66 medical facilities in 22 regions to carry out clinical liver transplants, training 200 transplant professional personal and spreading the “pinnacle of transplantation technology.” In July 2006, the center was sponsored by the China Medical Board (CMB, a private foundation based in the U.S.) and became a “National Liver Transplant Training Center.” It has trained 385 doctors, who have become the backbone of organ transplant departments in other hospitals, where huge numbers of transplants are performed on the front lines. The center received funding from the National Natural Science Foundation and other key projects in clinical disciplines from the Ministry of Health. 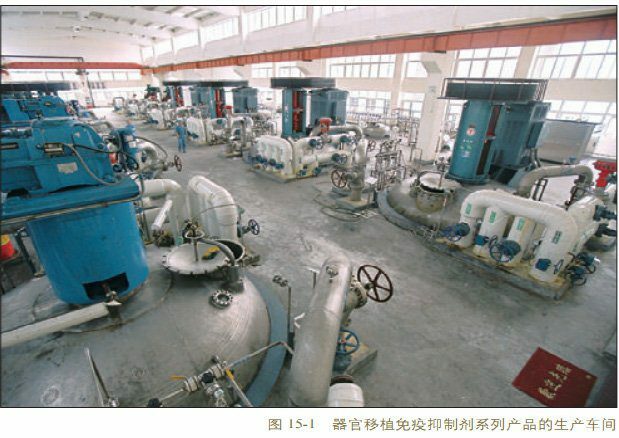 The hospital also concentrated manpower, material, and financial resources to industrialize related research results. The Ministry of Health guides some military and civilian medical institutions with strong technical capability, as well as large organ transplant centers, to conduct clinical teaching and practice, establish technical training bases for transplantation, and promote new transplantation technologies. A large number of transplant doctors have been trained in a short time to meet the rapid growth of China’s transplant industry. Liao Chongxian, the founder of the heart center, has been named “China’s top person in heart transplantation.”1812 On August 21, 1995, he performed the first heart transplant in Fujian Province and the first pediatric heart transplant and first heart-kidney transplant in China. In 2001, he established the Xiamen Heart Center Cardiovascular Surgery Department at Zhongshan Hospital and started his mobile heart transplant hospital model.1814 Its website says that the department performs heart transplants on a large scale and has helped more than 20 Class 3 Grade A hospitals to perform heart transplants in the past 10 years. The lung transplant center at Wuxi People’s Hospital claims to be among the top three in the world,1816 and claims to have completed more than half of all lung transplant surgeries in the country.1817 Its founder, Chen Jingyu, is thus renowned as the “No. 1 Lung Transplant Surgeon in China.” As reported in July 2014, Chen’s team often completed four or five lung transplants a day. Zheng Shusen served as the academic lead of the transplant center at the First Affiliated Hospital of Medical School of Zhejiang University. He was one of the pioneers of liver and multi-organ transplantation. The hospital has helped develop transplantation at Peking Union Medical College Hospital, Huashan Hospital of Fudan University, Xinhua Hospital Affiliated to Shanghai Jiao Tong University School of Medicine, the First Affiliated Hospital of Xinjiang Medical University, Zhongshan Hospital of Xiamen University, and other institutions. It has also established remote diagnostic systems with the First Hospital of Zhejiang Province and other hospitals in Zhejiang, Fujian, Guizhou, Xinjiang, and other areas. Its transplant capabilities radiate to more than 20 provinces and cities in China and have propelled the development of the country’s organ transplant industry. No. 181 Hospital of Guangzhou Military Command serves as the organ transplant center for Guangzhou Military Command. It has a number of PLA medical centers, clinical bases, research institutes, and key specialties under the Guangzhou Military Command. On August 12, 2003, the Xiamen Evening News published a report titled “New Breakthrough at Xiamen First Hospital: Two Liver Transplants in One Day:” In the morning of August 12, the hospital simultaneously completed liver transplants for two patients. Li Bin, director of the vascular hepatopancreatobiliary surgery department, revealed that if there are sufficient organ sources and recipients, they can perform three liver transplants in one day. However, the fact that the First Xiamen hospital’s newly detached vascular hepatobiliary surgery department can perform three liver transplants per day was beyond one’s expectation. We found that many leading institutions have been selected by the Ministry of Health to train a large number of transplant specialists for hospitals nationwide, allowing the industry’s work force to better keep up with demand. The organ transplantation center of the First Affiliated Hospital of Sun Yat-sen University claimed to offer the most variety of transplants nationwide and is among the top in transplant volume.1832 The hospital performed China’s first successful kidney transplant in 1972. Since Huang Jiefu in 1993 successfully implemented China’s first liver transplant in vitro blood bypass, the hospital is known as the birthplace of the second peak in China’s liver transplantation. In 2006, this center was approved by the Ministry of Health as a national kidney transplant technical training base. It has also become one of the three largest liver transplantation training centers sponsored by the China Medical Board (a private foundation based in the U.S.). In 2003, it incorporated with Terasaki laboratory of the United States and jointly established the Organ Transplants Tissue Typing Technology Training Center in Northwest China. By December 2012, this center had guided more than 10,000 kidney transplants for 23 hospitals in 13 provinces. It guided other hospitals in liver, kidney, heart, lung, and small intestine transplants in western China.1834 It trained more than 500 medical professionals for other domestic institutions, with some of them having become academic leaders. Since 2000, this center has held annual programs for continued education in kidney transplantation, with students from large general hospitals from 14 provinces and autonomous regions. “After learning from this program, the students started or carried out a greater number of high quality clinical kidney transplants and achieved a remarkable degree of continuing medical education. Unccessful research and trials that proved the feasibility of transplant technology were followed by a nationwide effort to make the technology readily accessible throughout China. In the past decade, these hospitals and individuals have achieved many innovations that enabled the growth of the transplant industry and made it possible to achieve its present-day scale. These achievements include lower rejection rates, shortened operation times, increased collaboration, and other advances. Many other transplant hospitals have also explored this field. Tan also established an anti-HLA antibody screening method, significantly reducing acute rejection responses. This technique has since been applied all over the country; Fuzhou General Hospital has established collaborative relationships more than 100 hospitals in 19 provinces and cities and organ sharing relationships with 15 transplant centers. The Second Hospital of Shandong University started researching DNA microarray tissue matching technology in 2003, achieving strict gene pairing between donor and recipient prior to transplantation. As a result, its transplant quality has increased substantially. 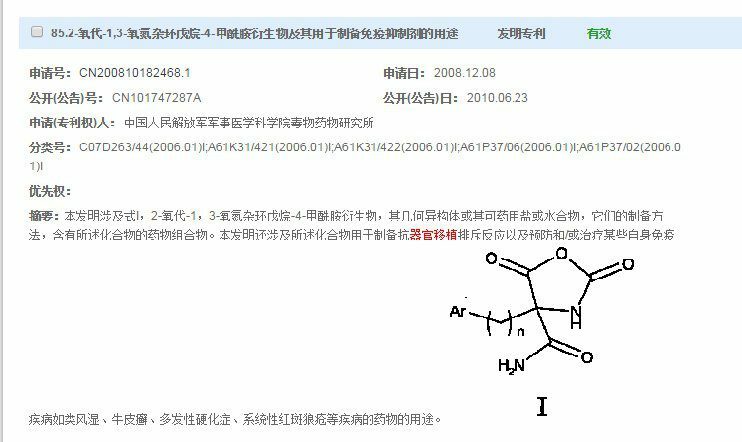 Among hundreds of transplant-related patents in China, about half are related to anti-rejection drugs and organ preservation solutions. Transplant centers have also developed alternative solutions for prolonging organ life. Zhongshan Hospital of Shanghai Fudan University performed its first liver transplant in 1978. Since 2001, liver transplantation at this hospital has seen rapid development, with increased variety, more innovations, shorter operating times (4 to 6 hours on average), less bleeding, and fewer complications. Some patients are discharged 9 days after their operation. Transplant recipients extend from patients of liver cancer to other end-stage liver diseases. The hospital’s quantity and success rate of liver transplantation lead both the Shanghai region and the country.1870 Its liver surgery department recently started immediate outpatient follow-up treatments with its liver transplant patients, such that a patient receives their operation immediately after an exam and hospital admission, accelerating the treatment cycle. It has attracted patients from more than 10 countries and regions, including the U.S., U.K., Japan, Canada, South Korea, Hong Kong, Macau, and Taiwan. Even with a conservative two-week hospitalization period, its annual surgery volume can reach 5,000. 1728 “Implementation of the International Covenant on Economic Social and Cultural Rights in the People’s Republic of China”, April 14, 2005, paragraph 69, page 24. 1778 National Key Basic Research and Development Program (973 Program). 1779 National High Technology Research and Development Program (863 Program). 1780 Introduction of Shen Zhongyang. Ho Leung Ho Lee Foundation Foundation. 1781 Introduction of Zheng Shusen. Ho Leung Ho Lee Foundation Foundation. Source: Peking University Health Science Center Information Weekly, 2013, Issue 21, December 3, 2013. China Economic News. February 26, 2014. Source: Shenzhen Jing News, Edition. July 21, 2006. 1825 “Rui Jin Hospital (Organ Transplant Center).” Guangdong Province Medical and Health Information Site. Source: Sohu, December 26, 2003. 1875 “Liver Transplant Entering a New Era.” Hbver.com. / Source: Health News, May 10, 2005.